Jeonbuk were dominant as expected, Yoon Jung-hwan won on his debut and there was late drama in Incheon as 83,874 fans were out in full force in stadiums across the country on opening weekend. All the highlights can be found at https://www.youtube.com/playlist?list=PL7MQjbfOyOE2p-fr8GWQxtb9yJ7bjlNxm but SpoTV doesn’t allowing embedding on other sites (or at least, they didn’t last year). The opening game of the K League season saw Incheon take on promoted boys Gwangju. The visitors were in trouble early as a nifty pass in the box from Lee Chun-soo found Kim Do-hyeok. Kim made no mistake and blasted it past Jae Jong-hyeon on the near post to score the first goal of the K League. However, Gwangju equalised after a slightly fortunate own goal with Kim Dae-jung failing to clear off the line. Incheon’s game plan was simple – utilising Kevin Oris as a target man. The tempo died down with misplaced passes until the finish. Incheon thought they had won it when Oris’ shot took an unlucky deflection off of Jeon Joon-yeon, but Gwangju scored on the last kick of the game (right as I was about to enjoy some schadenfreude at Takeuchi’s expense… $%@&!) after Incheon couldn’t clear the corner. Rightback Lee Jong-min applied the finish. A dramatic 2-2 draw the final score. It was an Edu brace that gave defending champions Jeonbuk the victory in front of a 23,810 crowd at Jeonju World Cup Stadium. The hosts started confidently, with lots of time on the ball (61% possession in the first half). As a result, there were corners galore for the Green Machine (10 in the first half alone!). Lee Jae-sung in particular was pulling all the strings. In that light, it wasn’t surprising for him to draw a penalty with Edu converted, to the delight of the home fans. Seongnam fought back valiantly in the 2nd half but Edu completed his brace in the 83rd minute. Leonardo’s curler met the post but Edu tapped home the rebound to secure all 3 points for Choi Kang-hee’s men. Ugh, god, I have to write a review about this don’t I? Daejeon were poor, kept on trying to force everything up the middle of the pitch. Busan weren’t spectacular either but they were getting quality chances. Joo Se-jong had a particularly good game for Busan, acting as the central playmaker in a 3-5-2. Oh Seung-hoon made a couple key saves but Wesley scored the winning goal, a sublime header. It was a rather low quality game at the Big Bird as Blue-taka met Steel-taka in the opening game on Sunday. Controversy arrived to save me from boredom however, as rightback Oh Beom-seok was sent off (two yellows) for two consecutive off-the-ball offenses on the same untaken freekick. Pohang didn’t look like they would take advantage but eventually got the away triumph. Yeom Ki-hun was forced into a 3v1 overload, dispossessed and the Steelers took the lead through a fantastic Son Jun-ho strike. Pohang’s skipper Kim Won-il was sent off in the latter stages but the Bluebirds ran out of time. A sellout crowd in Gwangyang witnessed a one-all draw between the Dragons and the visitors Jeju United. Jeong Da-won scored the first goal after a fantastic solo effort from the right flank. The right back played a one-two of sorts with Song Jin-hyung before firing past Kim Byung-ji. Jeonnam found an equaliser late on however through Stevo Ristic as a cross swung into the box and the Jeju players failed to clear the ball, allowing Stevo to blast it home from point-blank range. It was a winning start to Yoon Jung-Hwan’s K League coaching career as the former Sagan Tosu boss led Ulsan to a convincing 2-0 victory against Seoul. 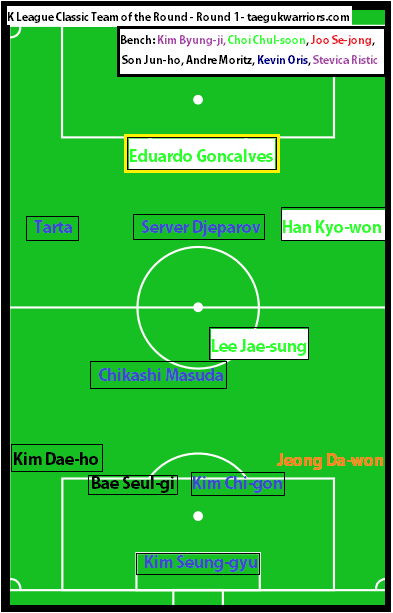 Yoon made an interesting decision to leave Kim Shin-wook on the bench, opting instead to use Yang Dong-hyun. Indeed, it was Yang who scored the first goal of the game, a deflected Djeparov shot finding Tarta on the left. The Brazilian chipped a beautiful cross which Yang would not squander. Kim Seung-gyu was also sublime in goal, putting in a man of the match shift and making a few quality stops. Ulsan’s midfield was clinical, pragmatic and effective and the second goal saw Server Djeparov score on his debut with a perfect finish after a on-point cutback. Ulsan could have added a couple more in the 2nd half but ultimately Yoon will be very pleased with his team’s performance. Some thinking to do for Choi Yong-soo as Seoul finish the day bottom of the league. (Heh.) In all seriousness, Kim Min-hyeok (not to be confused with the Asian Games winning CB Kim Min-hyeok) as a #10 of sorts was poor and Seoul had 60% possession but nothing more than a few long shots against the best goalkeeper in the league to show for it. In a 4-2-3-1, since that’s what most teams are playing, or a variant of it. I am not a graphic designer. Pretty damn good. 5/6 correct results and 2/6 correct scores. Good start for me this weekend. Jalgayo for now from the TSC! Time to go watch United destroy the Arsenal. COME ON YOU REDS! For those without Twitter (or don’t check the Tavern’s mini-feed in the sidebar), Park Chu-young has signed a deal with FC Seoul. where to look for your prediction for this coming week? well, you were spot on sir for last week, I’ll trust you again.